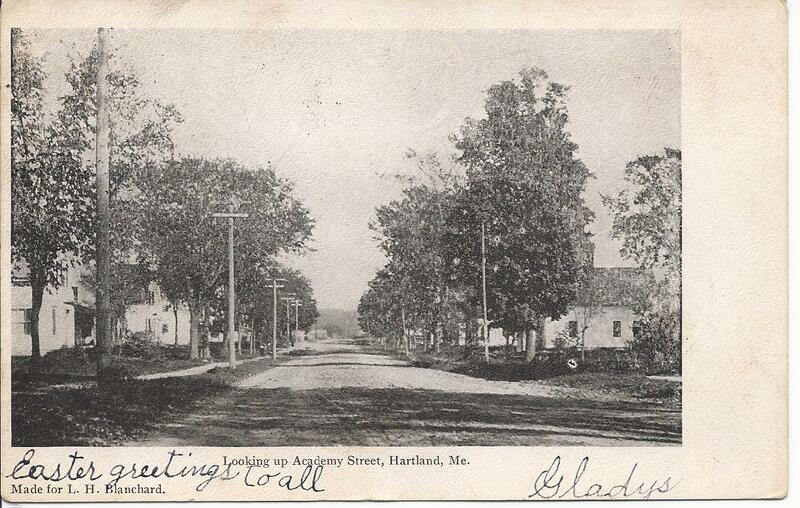 Real photo postcard showing Academy Street at Hartland, Maine. The postcard was used by Gladys to send an Easter greeting to Master Aubrey Johnnette at Damariscotta, Maine. I believe that Aubrey's name was actually Aubrey Johonnett. Aubrey H. Johonnett was born 1 April 1896 at Atkinson, Maine, where I believe his father was pastoring at the time. 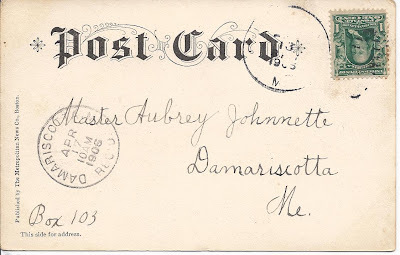 His parents were Reverend Charles Henry Johonnett and wife Harriet R. (Rowe) Johannett, born in Palmyra, Maine, and Dover-Foxcroft, Maine [either Dover or Foxcroft, as the towns didn't merge until 1922], respectively. Other towns where Reverend Charles Henry Johonnett pastored include Lincoln, Maine, and Damariscotta, Maine. I believe that Harriet R. (Rowe) Johonnett was Charles' second wife; his first wife was Minerva M. (Mitchell) Johonnett of Troy, Maine. Aubrey's paternal grandparents were Herman Gould Johonnett and wife Sarah A. (Lord) Johonnett, born in Palmyra, Maine, and Lebanon, Maine, respectively. His maternal grandparents were Jerry and Abbie (Sands) Rowe, born in Palermo, Maine, and Sebec, Maine, respectively. In the 1920 Census, Charles Henry Johonnett and wife Harriet were farming at Palmyra, Maine; their children were living with them. Harriet died in 1921. In the 1930 Census of Palmyra, Charles was still farming, and the children were at home with him; all were single.